But the true one, drinks of Your sumptuous nectar. Born at Tarsus in Cilicia of a noble family, he was widely known for his admirable character. When Gregory the Theologian resigned as Archbishop of Constantinople, Nektarios was praetor of Constantinople. Preparing for a journey to Tarsus, he called on the Bishop of Tarsus, Diodore, who was attending the First Synod of Constantinople (Second Ecumenical Synod of 381), to ask if he could take letters for him; his appearance and manners struck Diodorus so forcibly that he at once determined that he should be advanced as a candidate for Bishop; making an excuse of attending to some other business, he took Nektarios to see Meletios. 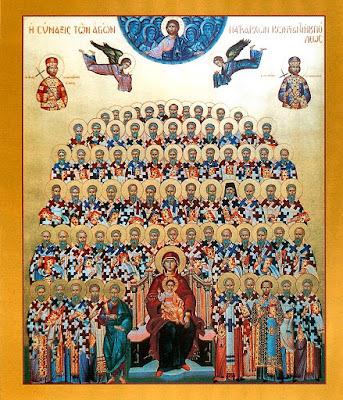 When the Emperor Theodosius I wanted the Bishops at the Synod to suggest new candidates and reserving to himself the right of making the choice, the Bishop of Antioch put at the bottom of his list Nektarios' name. The Emperor having read the lists, declared Nektarios to be his choice. This caused some amazement amongst the Fathers who wanted to know who was this Nektarios. He was still only a catechumen. There was much astonishment at the emperor's unexpected choice, but the people of Constantinople were delighted at the news as was the whole synod. Nektarios was duly baptized and his clothes were changed for the robes of a Bishop of the Imperial City and became at once president of the Second Ecumenical Synod. Nektarios ruled for upwards of 16 years, and is thought of as having been a good prelate. His name heads the 150 signatures to the canons of the Second Ecumenical Synod. The 3rd canon declares that, "...the Bishop of Constantinople shall hold the first rank after the bishop of Rome, because Constantinople is the new Rome." However, it was not until 1439 that the Roman Catholic Church recognized the Patriarchate of Constantinople as holding this position at the Synod of Florence. Unfortunately the Bishops of the West opposed the election result and asked for a common synod of East and West to settle the succession and so the Emperor Theodosius, soon after the close of the second synod, summoned the Imperial Bishops to a fresh synod at Constantinople; nearly all of the same bishops who had attended the earlier second synod were assembled again in early summer of 382. On arrival they received a letter from the synod of Milan, inviting them to a great general synod at Rome; however they indicated that they must remain where they were, because they had not made any preparations for such long a journey. However, they sent three - Syriacus, Eusebius and Priscian — with a synodal letter to Pope Damasus I, Saint Ambrose and the other bishops assembled in the synod at Rome. The Roman synod to which this letter was addressed was the fifth under Damasus. No formal account remains of its proceedings, nor of how its members treated the question of Nektarios. Theodosius, did however, send commissaries to Rome in support of his synod. In his 15th letter (to the bishops of Illyria) he indicated that the church in Rome had finally agreed to recognize both Nektarios and Flavian. Six letters from Nektarios remain extant in the files of his predecessor Gregory the Theoologian. In the first he expresses his hearty good wishes for his episcopate. The last is of great importance, urging him not to be too liberal in tolerating the Apollinarians. In 383 a third synod at Constantinople was held. In spite of the decrees of bishops and emperor, the Arians and Pneumatomachians continued to spread their doctrines. Theodosius summoned all parties to the Imperial City for a great discussion in June, hoping to reconcile all differences. Before this he had sent for the Archbishop and told him that all questions should be fully debated. After this, Nektarios returned home, full of anxiety and consulted the Novatianist Bishop Agelius, who felt himself unsuited to arbitrate on such a controversy. However he did have a reader, Sisinnius, a philosopher and theologian, to whom he referred the argument with the Arians. Sisinnius suggested that they should produce the testimonies of the old Fathers of the Church on the doctrine of the Son, and first ask the heads of the several parties whether they accepted these authorities or desired to anathematize them. Both the Archbishop and the Emperor agreed to this suggestion and when the Bishops met, the Emperor asked whether they respected "...the teachers who lived before the Arian division?" They confirmed that they did and he then asked if they acknowledged, "...them sound and trustworthy witnesses of the true Christian doctrine?" This question however produced divisions and so the emperor ordered each party to draw up a written confession of its doctrine. When this was done, the Bishops were summoned to the Imperial palace, where the emperor received them with kindness and retired to his study with their written confessions. Theodosius however rejected and destroyed all except that of the orthodox, because he felt that the others introduced a division into the Holy Trinity. After this, Theodosius forbade all sectarians, except the Novatianists, to hold divine services or to publish their doctrines or to ordain clergy, under threat of severe civil penalties. In 385 the emperor's wife Aelia Flaccilla (or Placilla) and their daughter Pulcheria died. The archbishop asked Gregory of Nyssa to preach the funeral sermons for both of them. Towards the close of his episcopate, Nektarios abolished the office of presbyter penitentiary, whose duty appears to have been to receive confessions before communion. This was because a priest after he had confessed a certain woman told her to remain in the church to fast and pray, but while there she was abused by a deacon, thus creating a scandal. He therefore ordered that all those who approached the Divine Mysteries should do so according to their own conscience. His example was followed by nearly all other Bishops. The presbyter penitentiary was added to the ecclesiastical roll about the time of the Novatianist schism, when that party declined to communicate with those who had lapsed in the Decian persecution. Gradually there were fewer lapsed to reconcile, and his duties became more closely connected with preparation for communion. Nektarios died in office on 17 September 397 and was succeeded by Saint John Chrysostom. Having gone forth to Him, he was glorified in return. He was the brother of Nektarios, Chrysostom's predecessor, and had served as archpresbyter under Chrysostom. In earlier life his brother had selected him for the bishopric of Tarsus, and had attributed his refusal to an ambitious design of becoming his successor at Constantinople. On this, Palladius asserts, he swore voluntarily that he would never accept the see of Constantinople. After he had passed his 80th year, the success of the intrigue of Aelia Eudoxia, queen of emperor Arcadius, and Theophilus, Patriarch of Alexandria, against Chrysostom opened an unexpected way for his elevation to the archiepiscopal throne. Eudoxia and the party now triumphant wanted for their new archbishop a facile tool, under whose authority they might shelter the violence of their proceedings. Such an instrument they had in Arsakios. Moreover, his hostility to Chrysostom had been sufficiently testified at the synod of the Oak, when he appeared as a witness against him and vehemently pressed his condemnation. He was consecrated archbishop on June 27, 404 in the Church of the Holy Apostles. Chrysostom, on hearing of it, denounced him "as a spiritual adulterer, and a wolf in sheep's clothing". The diocese soon made it plain that they regarded the new archbishop as an intruder. With the exception of a few officials, the dependants of the court party, and the expectants of royal favor, the people of Constantinople refused to attend any religious assembly at which he might be expected to be present. Deserting the sacred edifices, they gathered in the outskirts of the city, and in the open air. Arsakios appealed to the emperor Arcadius, by whose orders, or rather those of Eudoxia, soldiers were sent to disperse the suburban assemblies. Those who had taken a leading part in them were apprehended and tortured, and a fierce persecution commenced of the adherents of Chrysostom. We learn from Sozom, that Arsakios was not personally responsible for these cruel deeds; but he lacked strength of character to offer any decided opposition to the proceedings of his clergy. They did what they pleased, and Arsakios bore the blame. Arsakios' position became intolerable. In vain all the bishops and clergy who, embracing Chrysostom's cause, had refused to recognize him were driven out of the East on November 18, 404. This only spread the evil more widely. The whole Western episcopate refused to acknowledge him, and Pope Innocent I, who had warmly espoused Chrysostom's interests, wrote to the clergy and laity of Constantinople strongly condemning the intrusion of Arsakios, and exhorting them to persevere in their adhesion to their true archbishop. It is no cause for surprise that Arsakios's episcopate was a brief one, and that a feeble character worn out by old age should have soon given way before a storm of opposition so universal. Who was not ignorant of the wiles of the devil. 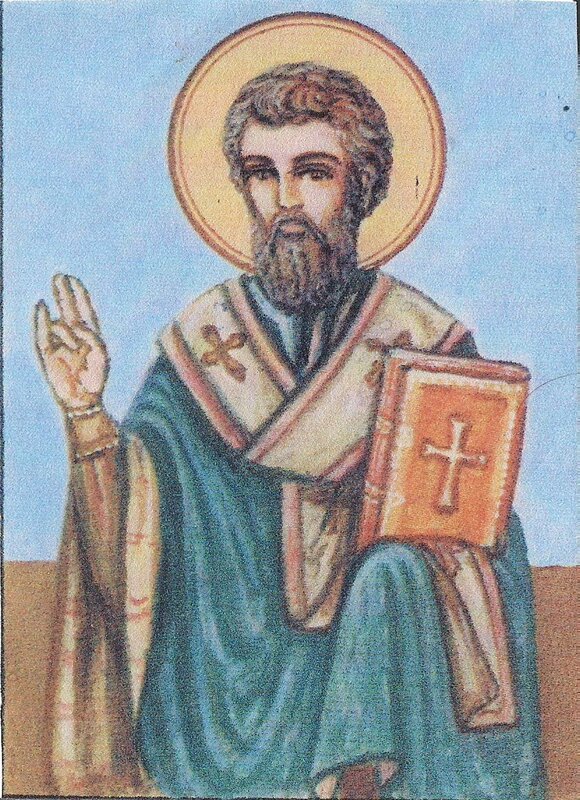 Sisinios was priest in the area of Elaea and had become known for his virtues and piety, as well as for acts of charity. After the death of Archbishop Attikos of Constantinople, the patriarch's throne was vacant for some time, as there was controversy about the choice of a successor. According to the dominant view, this period was about four months and ended with the election of Sisinios in February 426. For his consecration and establishment as Patriarch, the Emperor Theodosius II convened a meeting chaired by the Theodotus of Antioch. In the days of his Patriarchate, the question of the attitude of the followers of Chrysostom that came about after his exile was debated. The prefect of Constantinople, Optatos, raised the issue by initiating an investigation into the burning of the council house and Hagia Sophia during the episodes of those days. He suspected two clergy, the presbyter Tigrios and the reader Eutropios, whom he had arrested and imprisoned. It was during this time that Patriarch Sisinios said that he saw a young man in a dream standing at the sacred bema of the Church of Saint Stephen, who said that he lamented the fact that after traversing the entire city, he could not find a good man except Eutropios. The Patriarch related this dream to a certain presbyter, asking him to investigate who this Eutropios might be. The presbyter found Eutropios in prison, but he died soon after. Patriarch Sisinios I died on December 24, 427.